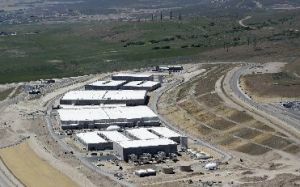 By Caroline Houck on Thursday, June 13th, 2013 at 12:14 p.m.
An aerial view of the National Security Agency's Utah Data Center in Bluffdale, Utah, which has come under scrutiny for its role in the collection of data on telephone and Internet traffic. With revelations that the federal government has been collecting data on phone calls and Internet usage, some have questioned whether President Barack Obama has broken promises he made in the 2008 campaign. YouTube videos have popped up, juxtaposing speeches Obama made as a candidate in 2008 with his more recent argument that trade-offs must be made to protect the American people. Some see this as a reversal in his positions. So we went back and looked at promises tracked in our Obameter and other coverage of the 2008 election to see where Obama stood on the spectrum of security and privacy. In the years leading up to the 2008 campaign and in the early stages of the campaign itself, Obama regularly emphasized the importance of civil liberties and the sanctity of the Constitution. "We need to find a way forward to make sure that we can stop terrorists while protecting the privacy, and liberty, of innocent Americans," then-Sen. Obama said when he voted against Michael Hayden’s confirmation as CIA director in 2006. "As a nation we have to find the right balance between privacy and security, between executive authority to face threats and uncontrolled power. What protects us, and what distinguishes us, are the procedures we put in place to protect that balance, namely judicial warrants and congressional review. ... These are concrete safeguards to make sure surveillance hasn’t gone too far." During his presidential campaign he reinforced these earlier stances by promising to "strengthen privacy protections for the digital age and … harness the power of technology to hold government and business accountable for violations of personal privacy." Though our Obameter tracking of this promise notes that his specific pledges pertained more to safeguards against commercial privacy infringements than governmental intrusions, he did promise to protect citizens’ privacy. As of Jan. 14, this promise was "in the works," as both Obama and Congress considered various measures to protect and define individuals’ Internet privacy. But many of Obama’s criticisms of government surveillance specifically targeted President George W. Bush’s warrantless wiretaps and particular applications of FISA and the USA Patriot Act that Obama called excessive or illegal. "I will provide our intelligence and law enforcement agencies with the tools they need to track and take out the terrorists without undermining our Constitution and our freedom. That means no more illegal wiretapping of American citizens. No more national security letters to spy on citizens who are not suspected of a crime. No more tracking citizens who do nothing more than protest a misguided war. No more ignoring the law when it is inconvenient," Obama said in 2007, adding that "the FISA court works." Again critiquing "the Bush administration's initial policy on warrantless wiretaps because it crossed the line between protecting our national security and eroding the civil liberties of American citizens," Obama promised to "update the Foreign Intelligence Surveillance Act to provide greater oversight and accountability to the congressional intelligence committees to prevent future threats to the rule of law." He also vowed to "revisit the Patriot Act to ensure that there is real and robust oversight of tools like national security letters, sneak-and-peek searches, and the use of the material witness provision." Midway through Obama’s first term, we rated both of those promises as compromises. Although no substantive changes have been made to enhance oversight of surveillance under the FISA statute or Patriot Act, the Obama administration has voluntarily enacted several measures in the executive branch. Most notably, the Justice Department implemented oversight reforms from a 2009 bill that failed to pass Congress. Obama also targeted the Bush administration’s use of executive orders to conduct surveillance programs, saying "most of the problems that we have had in civil liberties were not done through the Patriot Act, they were done through executive order by George W. Bush. And that’s why the first thing I will do when I am president is to call in my attorney general and have he or she review every executive order to determine which of those have undermined civil liberties, which are unconstitutional, and I will reverse them with the stroke of a pen." "I take the Constitution very seriously," he said. "The biggest problems that we’re facing right now have to do with George Bush trying to bring more and more power into the executive branch and not go through Congress at all. And that’s what I intend to reverse when I’m president of the United States of America." The one clear instance of Obama reversing course on a civil liberties promise occurred not with the recent publication of the NSA scandal, but nearly five years ago. In its original incarnation, the FISA statute was designed to protect citizens’ civil liberties — leveling fines, for instance, at any telecommunications company that helped government agencies conduct surveillance on its customers without warrants. In the early stages of the Democratic Primary, then-Sen. Obama promised to filibuster any bill that would give companies immunity from those fines — essentially removing their major deterrent from complying with wiretap requests. But in July 2008, Obama voted for a bipartisan compromise bill updating the FISA statute that granted telecommunications companies legal immunity in these cases. Though this prompted a backlash among his more liberal supporters, Obama defended his decision at the time, calling the bill a "marked improvement over last year’s Protect America Act" and saying it provided "effective intelligence collection tools with appropriate safeguards." Meanwhile, on a topic related to the recent leak about surveillance, Obama promised in 2008 to increase protections for whistleblowers. Obama has improved conditions for some whistleblowers, such as government workers who report fraud, waste and abuse within federal agencies. But he has not succeeded in enacting any structural reforms, so we rated this promise as a Compromise last year. The notable exceptions to these improved conditions, however, are whistleblowers from the national security apparatus — whistleblowers like Edward Snowden. As noted in the Obameter ruling, individuals who have leaked information from the intelligence or national security communities have generally been prosecuted under the Espionage Act and enjoy none of the protections other whistleblowers do.